All countries now have a flag, and North Korea is no exception. However, this tradition is, from a historical perspective, not so old. Most Asian countries did not have flags until the late 19th century. The Korean flag, for example, was adopted in 1883. It was designed under the influence of the Japanese one, as contemporary Japan, reasonably enough, was seen by Koreans as symbolic of progress. The Japanese flag was called the Flag of the Rising Sun, and the Korean one also got a name: the “Flag of the Great Extremes” (or “Taegeukgi” in Korean). The first image of the flag of Korea. After Korea was annexed by Japan in 1910, the Japanese did not design any specific flag, so the Flag of the Great Extremes remained the sole symbol of Korea, and was re-adopted in 1945 when Korean independence was restored. After Communist takeovers, not all flags of the ancien regime were put in the dustbin of history. Sometimes, as in Cuba, Czechoslovakia or Poland, it was simply not changed. The more common strategy was to add a communist symbol, such as a hammer and sickle, to the old flag. There were, however, some states, like China and North Vietnam, which followed the example of the USSR by adopting a completely new flag. Therefore, the fate of the Flag of the Great Extremes was unclear. The flag remained in use, and it was not until 1947 that the question came to the Soviets’ attention. An instrumental role in the flag being changed was played by Kim Tu Bong, who was then Vice-Chairman of the Provisional People’s Committee for Northern Korea. 56-year old Kim was by far the most educated man in the contemporary northern Korean elite. Pak Il, a Soviet-Korean then working as in interpreter in the 25th Army, which was then in control of northern Korea, told the story. One day in summer 1947, Major General Lebedev summoned Kim to his office and told him that soon a new state was to be created in northern Korea, and that this state would need a flag. Therefore, Lebedev asked Kim to explain the meaning of the current flag and say whether it should be kept. Kim started to explain, in detail, the meaning of the flag. However, from a Soviet military man’s point of view, the Chinese philosophy upon which the design was based was little more than medieval superstition. After listening for some time to yins, yangs, trigrams of the Book of Changes and other oriental stuff, Lebedev interrupted Kim with a simple “Enough”. A Soviet Colonel present at the discussion grinned: “It sounds like a legend to me”. That was probably the moment that Lebedev decided to abolish the flag, despite the fact that Kim Tu Bong expressed support for its usage. A few months later, Pak Il got a call from Moscow. His interlocutor dictated to him the design for a new flag, which Pak carefully transcribed. Unfortunately, we will probably never know who designed the new flag and what he had in mind, though there is a slim chance that he might still be alive. The new flag, which would be called “the Flag of the Republic” in the North and “the Flag of the People’s Republic” in the South, was yet to be adopted officially. For a few months the Flag of the Great Extremes remained in use. 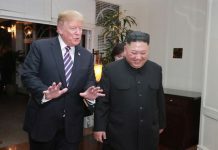 The last notable event at which it was hoisted was the 1948 meeting between Kim Il Sung and Kim Gu, a prominent nationalist politician from the South. Ten days after the new flag was adopted, Kim Tu Bong gave a press conference explaining the decision, and in August 1948 published a book entitled, “On the Establishing of the New National Flag and the Abolition of the Flag of the Great Extremes”. Ironically, the book was published about the same time the Republic of Korea was established in Seoul… with the Flag of the Great Extremes as its national flag. The book is interesting, probably the most un-North Korean North Korean book this author has ever read. It is written in slightly archaic, very pompous Korean and has zero references to Kim Il Sung; moreover, its very tone is very different from the average North Korean text: Kim Tu Bong addresses the people who disagree with the flag change and tries to explain the reasons behind it, without calling his opponents traitors and/or American or Japanese spies. In North Korean publications the possibility of an average citizen opposing an official decision, or just failing to support it vigorously enough, is not normally discussed. The book is divided into seven chapters, all shaped around a specific thesis: ▲ The New Flag is the symbol of the newly emerging country with a bright future; ▲ The New Flag is the symbol of the prosperous and harmonious country; ▲ The New Flag is the symbol of the happy country developing in brilliance; ▲ The Flag of Great Extremes contradicts the nature of the new democratic order; ▲ The “scientific” reasons beyond the Flag of Great Extremes are, in fact, unscientific and superstitious; ▲ From the very beginning, there was no standard meaning, nor standard design, for the Flag of Great Extremes; and ▲ Due to the needless unintelligibility of the Flag of Great Extremes, its multifariousness causes disunity. The fact that the majority of the book was dedicated not to the symbol of a happy country developing in brilliance but rather to the flag contradicting the nature of the new democratic order, causes one to think that maybe the major reason why Kim Tu Bong wrote it was to make himself believe that the flag change was the right thing to do. After all, he had been quite supportive of the old flag just a year earlier. In any case, over the years to come North Korea grew more and more independent from the USSR and Kim Il Sung began to design a new, self-centred, version of history. The active phase began in 1967, 19 years after the old flag was removed and 9 years after the man who removed it, Kim Tu Bong, was removed as well. 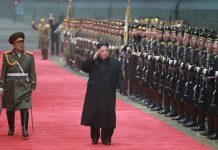 In the new version of North Korean history it was to be Kim Il Sung and his glorious Korean People’s Revolutionary Army who defeated Imperial Japan, with a little bit of help from the USSR, and the Ever-Victorious Iron-Willed Brilliant Commander himself who directed the creation of the new state. Obviously, the new myth contained no place for the Flag of the Great Extremes, and all mentions of it were removed and all photos of the events where the old flag was hoisted were edited according to the party line. Here are two examples. The formation of the Chosun Workers’ Party in 1946. Kim Il Sung’s first public appearance, in October 1945. O, the Flag of the Republic! In it the can see the glorious history of struggle of our fatherland and its headlong run to the glorious future following the path of prosperity. Even now we cannot forget the great appearance of the Fatherly Leader who had created an illustrious design of the Republic’s national flag and gave instructions and the flag’s ideological meaning and the ways to manifest that meaning. This is, of course, a fabrication and not a very good one. As one can see from the image above, the North Korean flag has white surrounding the star and two white strips. Two stripes can hardly symbolise unity. Rather, they have the opposite meaning. Nevertheless, this creation of the unknown Soviet official is still the most important symbol of North Korean state, and will probably remain so for as long as North Korea itself exists.